Oct. 8: Augsburg Native American Film Series: The Eagle and The Condor–From Standing Rock with Love. The bad news is that the Nebraska Public Service Commission (PSC) today approved the Keystone XL Pipeline through the state on a 3-2 vote. The good news is that it approved an alternative route to the one proposed by TransCanada, a route the company opposes. Articles from news organizations and environment groups has been quick. An initial article from Politico says this could bring to an end a nearly decades long regulatory battle over the pipeline and Reuters is framing the vote as a win for Trump. The Keystone XL (KXL) tar sands pipeline was just approved by Nebraska’s Public Service Commission, but there is some good news. The PSC has approved an alternative route that TransCanada, the company behind the pipeline, has called unworkable. That means TransCanada still has multiple hurdles to overcome — so this pipeline may never be built. That gives Sierra Club and our allies the perfect opportunity to fight back by urging banks to stop funding Keystone XL. The Sierra Club is urging members to Send a message to Wells Fargo, a key funder of TransCanada, demanding that they stand with the landowners and tribes along the path of Keystone XL and not fund this dangerous pipeline. Greenpeace is targeting Chase banks: Share today’s news on Facebook to put Chase Bank and other funders on notice that you are watching and you are not going anywhere. YOU will keep resisting this pipeline. Native groups also have opposed Keystone XL. I will add their comments when I get them. I went to the Parkway Theater last night to watch the premiere of Black Snake Killaz. The documentary had its uplifting moments, but was a reminded that the deck is stacked against water protectors. Treaty rights don’t matter. A lack of adequate environmental review didn’t matter. The government could use military weapons. concussion grenades, mack and more and call the water protectors terrorists. A para-military private security firm was allowed to operate against the water protectors and influence law enforcement’s response, and did so without a license to operate in the state. I checked my email when I got home and read a news update from MPR, another “stacked deck” story about water protectors. It requires that I also run a correction to the post I wrote Thursday: Keystone Spills 200,000 Gallons of Tar Sands Crude, Could Affect Keystone XL Vote Monday. It discussed how the timing of a big spill on the Keystone Pipeline could affect a key vote on its sibling project, Keystone XL. The Nebraska Public Services Commission is scheduled to take a final vote on Keystone XL Monday. Yes the leak happened, but no, it won’t affect the vote, according to the MPR story: Keystone pipeline leak won’t affect Nebraska ruling on expansion. State law “does not allow pipeline safety to be a factor in their decision,” the story said. Nebraska lawmakers gave the five-member commission the power to regulate major oil pipelines in 2011 in response to a public outcry over the pipeline and its potential impact on the Sandhills, an ecologically fragile region of grass-covered sand dunes. But when they passed the law, legislators argued that pipeline safety is a federal responsibility and should not factor in the state decision. The law makes no sense and is one more example of a rigged system. The current Keystone pipeline that runs from Alberta, Canada to Nebraska spilled 5,000 barrels, or more than 200,000 gallons of tar sands crude oil this morning, according to accounts in the Washington Post and other media outlets. The spill occurred just southeast of the small town of Amherst in northeast South Dakota, affecting either grasslands or agricultural land, the story said. This gives pipeline opponents one more example to use to try to stop other major projects, such as Keystone XL and Enbridge Line 3 through northern Minnesota. Keystone is the older sibling to the highly controversial Keystone XL pipeline proposal, which still awaits final approvals. (See map.) 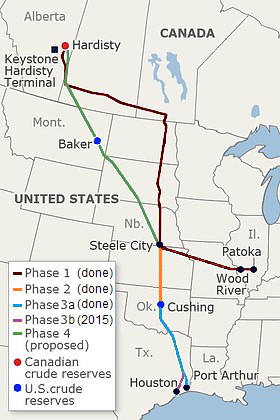 TransCanada, a Canadian-based pipeline company, is behind both projects. During his term, former President Obama rejected Keystone XL. But President Trump quickly reversed that, issuing an executive order to approve it. As the Post reports, the project still needs the approval of the Nebraska Public Service Commission (PSC). 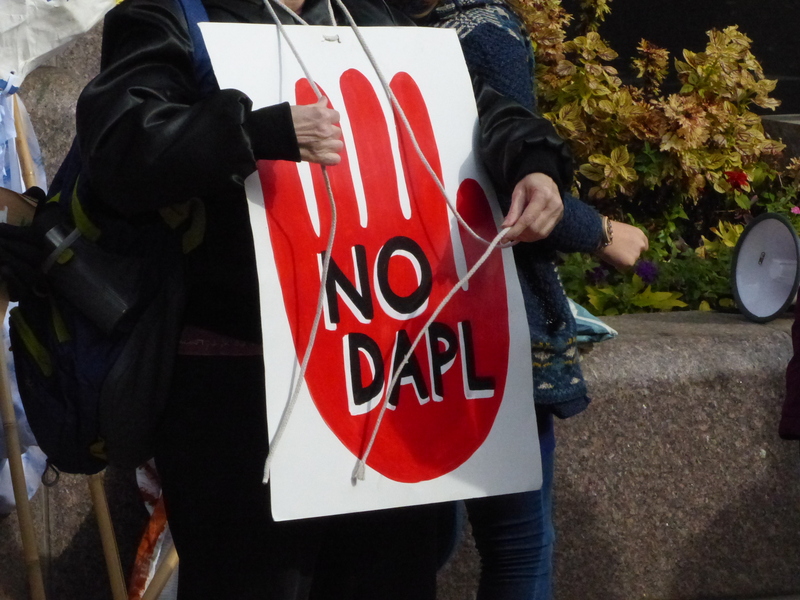 It just so happens the PSC had scheduled a key vote on Keystone XL for Monday. 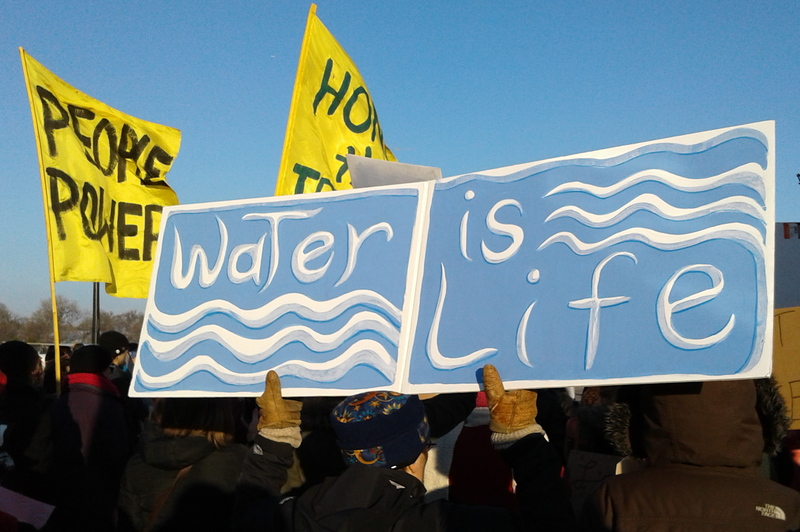 Activists are citing today’s spill as one more reason to reject Keystone XL. The approval [by Trump] followed years of intense debate over the pipeline amid hefty opposition from environmental groups, who argued the pipeline supports the extraction of crude oil from oil sands, which pumps about 17% more greenhouse gases than standard crude oil extraction. Environmentalists also opposed the pipeline because it would cut across the Ogallala Aquifer, one of the world’s largest underground deposits of fresh water. And this is when the line is brand new! One-third of Ohio’s endangered species rely on wetlands for habitat and survival, Miller said. Click on the story link to see a photo of how bad the spill is. Meanwhile, resistance to such projects continues. Indian Country Today reports on a unique alliance of Nebraska tribes, ranchers, and landowners that are resisting Keystone XL and other fossil fuel developments. Keystone XL will pass through traditional Ponca lands, lands that were taken from them. They still consider these ancestral lands as part of their culture and traditions. On April 29, members of the Ponca Tribe began a remembrance walk to commemorate their forced removal from their traditional lands in the 1870s, the story said. The planned 12-day walk covered the 273 miles from Niobrara, Nebraska, to Barneston. For the past three years, members of … various groups have been gathering in Neligh, Nebraska, to plant Ponca sacred corn where the pipeline’s route crosses the trail the tribe was forced to take away from their homeland. They sow the corn by hand, following principles of prayer rooted in a deep respect for the land. Minnesota, you are next up in the efforts to stop pipelines from threatening our signature lakes and rivers. Enbridge, a energy transportation company, is proposing to abandon an old and failing tar sands pipeline through northern Minnesota and wants to install a new and larger pipeline, including a significant route change. The 337-mile pipeline, called Enbridge Line 3, would pass through the Mississippi headwaters region and through traditional Anishinaabe wild rice areas. The Minnesota Department of Commerce is expected to release a draft Environmental Impact Statement (EIS) Tuesday, May 16. The EIS should draw media attention and elevate the public debate over this project. There is expected to be a 60-day public comment period. More information coming soon on how to get involved. For more background, see the Enbridge Line 3 Page of our blog.